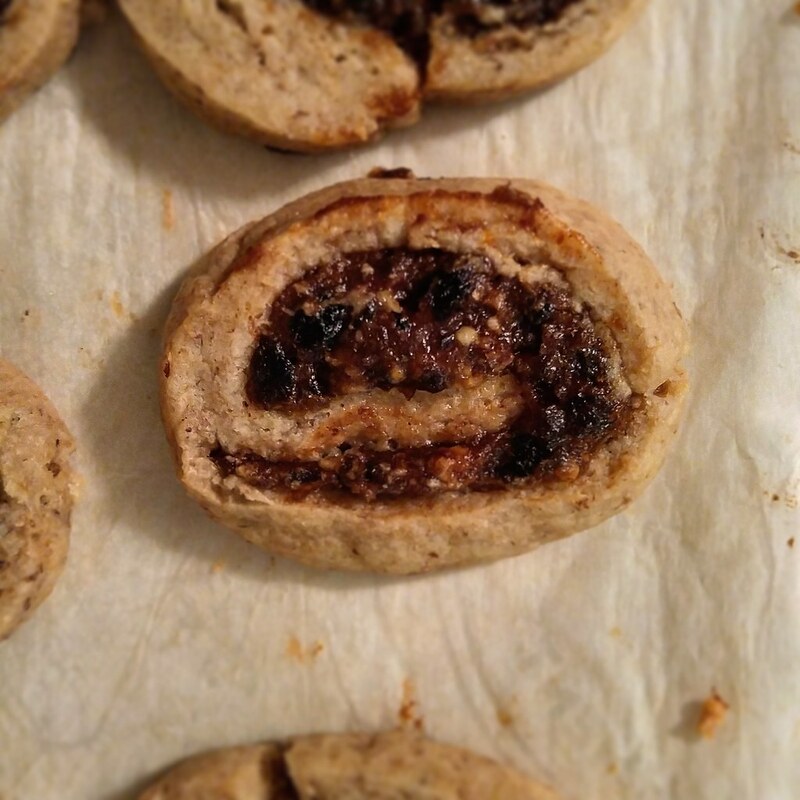 Date-Nut Pinwheel Cookies | What Smells So Good? Cream butter, shortening, sugars, flax seed, vanilla and wine. Beat in the flours, baking powder and salt. Place dough between 2 sheets of parchment paper and, using a rolling pin, roll out to make a rectangle about 10 x 12-inches large and ¼-inch thick. Place dough in the refrigerator to chill for 30 minutes or until firm. Place dates in a small pot with the white wine. Bring wine to a boil, reduce heat to medium-low and simmer, stirring occasionally, for 8 to 10 minutes, or until dates are soft and the wine is almost completely absorbed. Place dates, walnuts, honey, rosewater and orange rind in the bowl of a food processor and pulse until mixture becomes a thick, sticky paste. Remove dough from refrigerator. Remove top sheet of parchment paper, and cut dough in half lengthwise to make two 10 x 6-inch (25 x 15-cm) rectangles. Spread filling mixture generously over each half of the dough leaving a ½ -inch (1-cm) border all around. Roll the first piece of dough into a tight log, beginning with the long edge. Repeat with second piece of dough. Use a sharp knife to cut the log into ¼” slices. Place cookies on parchment-lined baking sheets and bake, 1 sheet at a time, for 12 minutes. Cool on a rack.